Add some salad ingredients like chopped cucumber and cherry tomatoes to any leftovers for lunch the next day. 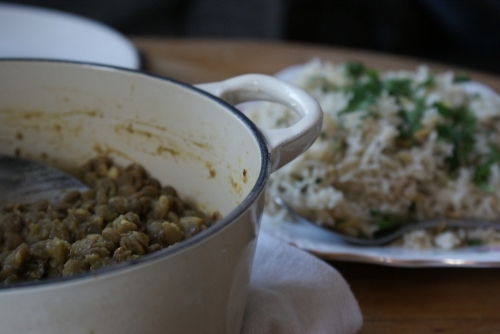 An easy, tasty rice dish, perfect with any curry! Toast the almonds in a dry pan until golden and set aside. Fry the onion in a glug of oil for a few mins, add the cinnamon, cardamom and bay, fry for a second. Add the rice, stir to coat in the oniony oil. Pour in the vegetable stock and bring the pan to the boil, cover and turn to the lowest heat possible. Cook for 20mins. Fluff the rice, scatter with the parsley and almonds.